Here are a few books that you might find interesting. 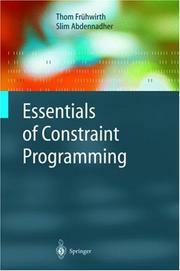 The book is a short, concise and complete presentation of constraint programming and reasoning. The use of constraints had its scientific and commercial breakthrough in the 1990s. Programming with constraints makes it possible to model and solve problems with uncertain, incomplete information and combinatorial problems, as they are abundant in industry and commerce, such as scheduling, planning, transportation, resource allocation, layout, design and analysis. The theoretically well-founded presentation includes application examples from real life. 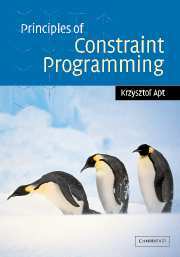 It introduces the common classes of constraint programming languages and constraint systems in a uniform way. Constraint solving algorithms are specified and implemented in the constraint handling rules language (CHR). 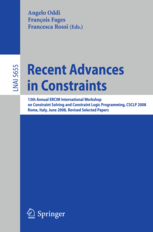 This book constitutes the thoroughly refereed and extended post-workshop proceedings of the 13th Annual ERCIM International Workshop on Constraint Solving and Constraint Logic Programming, CSCLP 2008, held in Rome, Italy, in June 2008. The 9 revised full papers presented were carefully reviewed and selected from 14 initial submissions. The papers in this volume present original research results, as well as applications, in many aspects of constraint solving and constraint logic programming. Research topics that can be found in the papers are 1rst-order constraints, symmetry breaking, global constraints, constraint optimization problems, distributed constraint solving problems, soft constraints, as well as the analysis of application domains such as cumulative resource problems and hybrid systems.